Parenting a Fiddle Leaf Fig plant is made simple thanks to Claire Akin’s guidance. Years of experience are packed into this easy-to-read book, and, as a result, I’m now a more confident plant owner. A must-have for any ficus lyrata caretaker, to finally understand your plant and make it thrive. Fiddle Leaf Fig plants make such a unique statement in a room. It’s hard not to get your attention taken away by its violin-shaped leaves when you meet one. If you’re reading this article you probably have your own Fiddle Leaf Fig plant or plan to acquire one. In all cases, you’re in the right place. This trendy plant is native to Africa and loves bright indirect sunlight. Maybe you’ve noticed a few brown spots, or your plant is visibly suffering from something and you don’t know what it is (dropping leaves, poor growth, dry tips or even pests). What to do in each case? This book will tell you how to decipher the signals. But first, convince yourself that it’s not all your fault and that plant signals are hard to interpret. 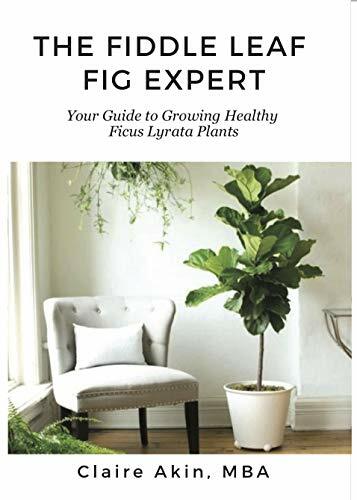 Thanks to Claire Akin, the Fiddle Leaf Fig plant expert, you will learn how to care for fiddle leaf fig trees in the long run, and finally understand their language. Okay, those tips are ‘stolen’ from the book and somehow made their way into this article ;D. The reason is that I think it’s very useful to know these tricks to interpret your plant’s signals correctly, whether you get the book or not. If the brown spots are starting on the edges of the leaves and spreading inward, the cause is likely dry air and underwatering. Basically a dry plant. If the oldest leaves towards the bottom of your plant are falling off first, it’s likely overwatering. If the leaves are falling off all over your plant it’s likely underwatering. Did you know that Fiddle Leaf Fig is named ficus lyrata for its large violin-shaped leaves? Lyra/lyrae refers to a lute or harp in Latin. The book covers evreything. Claire’s objective was to make the book the only resource on fiddle leaf figs that you’ll ever need. It’s available on Amazon for about 25 bucks, 10 on a kindle format. Want more tips for your plants and indoor jungle? Subscribe to the newsletter below or follow me on social media.